Your site can have as many pages and sub-pages as needed; we place no limits whatsoever on the number of pages that can be added to a site. Creating a new page is a matter of going to the Pages tab and clicking the Add Page button. 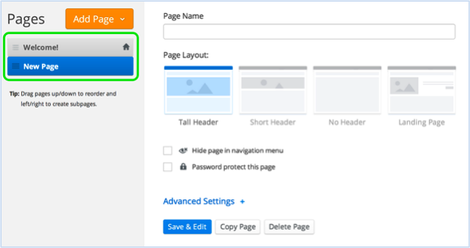 There is an option to Add a Standard Page or Add a Blog. For now let's focus on creating Standard Pages. Selecting the Standard Page option adds a new page to your list. Adding more pages is a matter of clicking Add Page and choosing Standard Page again (and again). 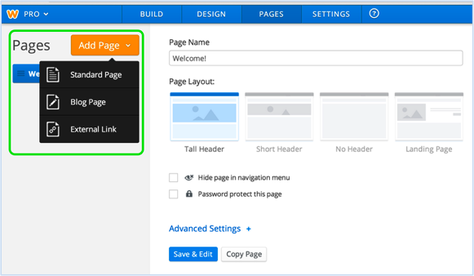 As you add (and name) each of your pages, they'll automatically become a part of your site's navigation bar. You can rearrange the order of the pages by clicking and dragging them up and down the Pages list. Dragging a page to the top of the list will make that page your Home. The Home page can be renamed to whatever you like; the name for this site's Home has been changed to Welcome. 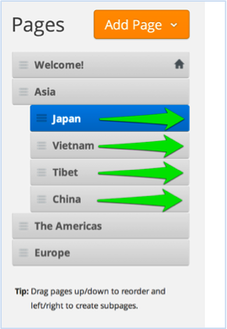 Changing the order of pages in the list will also change the order in which they're displayed in the navigation. 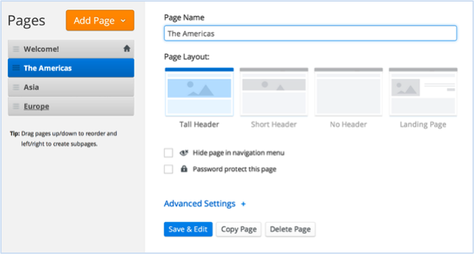 You're also able to create subpages of other pages. You can do this by dragging a page or pages underneath and to the right of another page. These subpages appear in a drop-down menu when you scroll over the page to which you connected them. To edit the content of a page, just click on its link from the navigation menu or go to the Pages tab, select the page form the list and click the Edit Page button. Now let's learn how to Edit the Header Image.